Image 1 of 16. Click to view fullscreen. A one bedroom, lovingly restored Breton longere ideal as a rural retreat to get away from the stresses of life. The cottage is peaceful and has all the amenities needed to make your stay comfortable. Being on the edge of the village, the centre of Seglien is only a 3 min stroll away. Seglien itself offers walks around the village exploring the beautiful "Vallee de la Scorff" and the rolling countryside. The location of Seglien is ideal for day trips out to the south, north and west Brittany. With booking our cottage, you should expect absolute peace and quiet. The cottage boasts a private garden with outdoor seating area, BBQ and lounge chairs. The kitchen/diner/lounge is furnished with comfortable and quality furnishings. A spiral staircase takes you to a spacious bedroom with a king size bed. The en-suite bathroom has shower, bath, sink and toilet. Again, all furnishings are of high quality and comfortable. Each cottage is equipped with woodburner, washing machine, fridge, freezer, dish washer and DVD player. We provide each cottage with a basket of wood, so that you can try out the stove in case the evenings turn a little chilly. We are an English / Australian couple with two very active boys. We have just finished a 4 year contract working in Shanghai, China after having lived in Mumbai in India and Qatar before that. Our next family adventure takes us back to the Middle East. We usually spend our holiday in our holiday home in France, and love it! We love the area of Seglien. The village itself is very quiet and peaceful. Being in central Brittany we find it is ideal for day visits to the coast. On the other hand, it is really nice to while away the afternoon walking around the village. Lac Geurdelan is a great place where we enjoy sitting in the sun and swimming in the lake. There is also a very enjoyable lakeside walk through the woods surrounding the Lake. From the village, there are a number of walks beside the river scorff. As we have travelled around the world we have stayed in some lovely properties and some that left a lot to be desired. In our renovation, we have wanted to give our guests a feeling of space, rather than staying in a small enclosed space - we are delighted with the results of our renovation. We bought the house on the edge of the village so that we didn't have to drive in the morning to get fresh bread and croissants. These are available in the village. The peace and quiet in the village is fantastic only the occasional tractor going by on its way to the fields. The en-suite bathroom comprises of shower and bath. Notes on accommodation: We have a wifi 'hotspot' in one of the out buildings for guests to use. Outside: The outside terrace area is well maintained and provides a patio area with table and chairs, a BBQ and easy recliners to while away the time in the garden. Cleaning / Towels / Linen / Maid service: Prices include linen and towels. We offer a cheaper stay whereby guests can opt to bring their own. Thank you - we had a lovely time exploring the area. We visited Bayeux, Mont Saint Michel, Lac de Guerlédan, Carnac Stones. About 10 minutes to nearest supermarket, 10 minutes to great pizzeria La Florentine, 25 minutes to nearest lac and an hour to west coast. Great fish restaurant at Plage de St Colomban called Kreiz An Avel near Carnac - I’d recommend the clams with garlic butter and gratin as a starter and St Jacque and shrimp gratin bake or sea bass (huge - hanging off both ends of the plate!). The cottage is quite charming and extremely well equipped with a very comfortable bed. We really enjoyed sunning ourselves in the garden in the early evening with a glass of wine. It was also nice not to have a TV or mobile phone reception but felt perhaps the ability to have WiFi in the Cottage would have been an added bonus.The surrounding area is very beautiful particularly around Lac de Guerledan, where a meal at the Merlin is a must. Josselin is another place well worth a visit. We would have liked to spent longer here and will certainly revisit if in the area again. This property in Seglien is perfect for couples looking for a peaceful retreat. 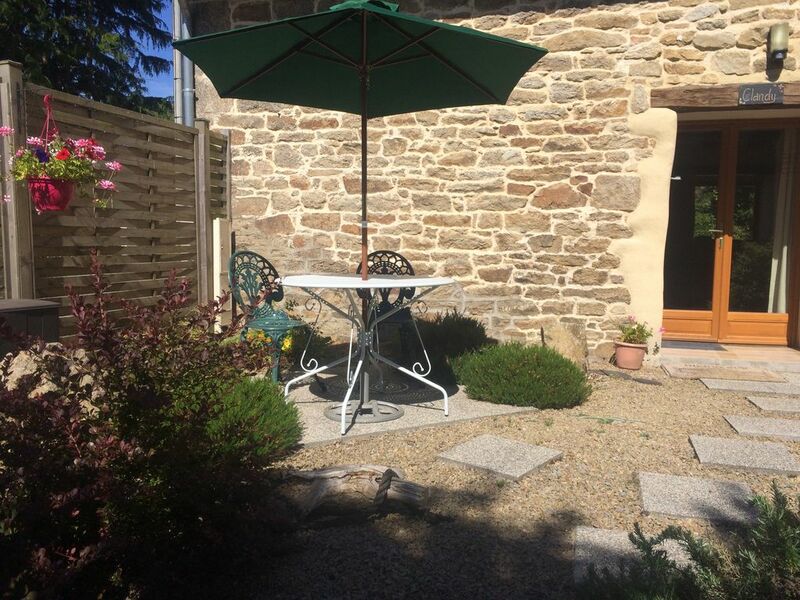 Perfectly situated for touring the area the gite is one of 3 one bedroomed gites all with their own space and garden area in a quiet village close to Pontivy and a short drive to supermarkets etc. The gite is beautifully presented and comfortable with everything you could want for a peaceful holiday. TV plays DVDs and CDs. No freezer compartment but everything else is covered. The perfect spot for couples looking for a quiet, peaceful break. With Le Lac de Guerledan and the Brest/Nantes canal right on the doorstep many leisure activities can be focused on the water: sailing, canoeing, rowing, water skiing, swimming or just relaxing by the lake on one of the many beaches. The southern beaches can be reached in 40 minutes, the Northern coast including St. Malo, in 90 minutes and the western beaches in approximately 2 hours. Brittany Ferries (www.brittany-ferries.co.uk) links St-Malo and Roscoff (both 90 mins from Seglien) with Portsmouth and Plymouth. Direct flights into Brittany are from airports throughout the UK. Lorient (45 minutes from Seglien). Dinard (90 minutes from Seglien). Rennes (90 minutes from Seglien). Nantes (2 hours from Seglien). Brest (3 hours from Seglien). The centre of Seglien is only a pleasant 3 minute stroll away. Booking Notes: 50% non-refundable deposit is required on booking. Full payment should be received 2 months prior to occupancy. (Short/weekend breaks and late bookings have different conditions - please email the owners) £100 refundable damage deposit is required at the time of Full payment. Changeover Day: Preferred Saturday in high season. However, please contact the owners for different options. Notes on prices: A deposit cheque of 100GBP is required for each week booked upon confirmation. Full payment is due 2 months before occupancy of the cottage. Prices are subject to change at owners discretion.